After watching the movie before me, my family rained on me that the movie was too violent. I understood reaction of family as a matter of course, because many audiences have strong likes and dislikes about the film. So I watched the movie with great expectations that the movie was strange, grotesque, violent. After the movie, I’ve thought about some scenes, which family said movie was cruel. It might be the scene that a person’s arm extended out of train in order to be punished at extreme cold. If it is not, it might be massacre scene in the dark tunnel. The reason why the movie was cruel, is not because of specific scene but because of film content. As for me, I suspected that characters inevitably have cannibalism. Especially, compartment, which make protein block, was reminiscent of ‘Delicatessen(1991)’ because of mise-en-scene. I was not comfortable to watch the movie due to whereabout of missing children. I doubt even the scene, which Wilford eat a steak. The movie was awful because of that imagination. The train, which Wilford created to cater for passengers, finally controlled and exploited them. At this point, Marxist theory, which human made material for himself but human is under the control of material, thought underlies the movie. However, director does not interfere in the age-old conflicts. What makes dystopia terrible is the fact we cannot deny that system. There is no alternative to ruler and ruled. Resources are limited and are distributed some people. Even though, people cannot get out the train. It is said that theme of ‘Snowpiercer’ is too much. By the way, it seems that ‘the theme’ is different to each person. 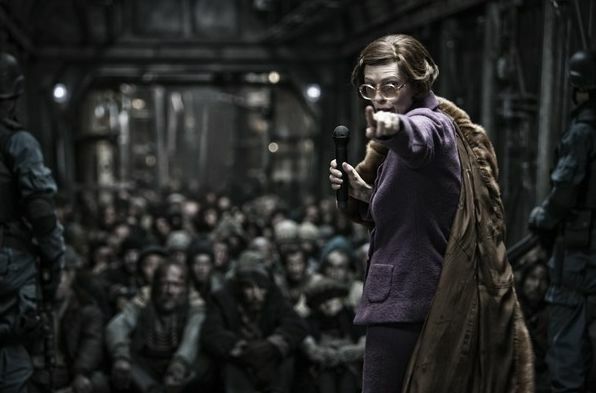 Dystopia of the name of SNOWPIERCER is a microcosm of society, which we actually live in. However, it is boring criticism about absolute power of controlled society expressed in the movie. That is suggestive old proposed–class struggle–. Later in the film, We can know it when we watch main character Curtis (Chris Evans) chat with train designer Wilford (Ed Harris). However, it seems that director’s main concern is not this. “The movie is about survival and life”, Tilda Swinton said in an interview. By doing this, that looks much better. However, we are missing the point. So what does director want to say? There is no that train Snowpiercer in the world. It is the worst-case scenario in the history of mankind. In the beginning of the story one question that if it goes ahead, we are not giving up our human qualities. In SNOWPIERCER, two propositions, “we do not give up human qualities” and “We will preserve it our species”, are not incompatible. Wilford of the ruling class and Gilliam of the subjugated class choose survival(preservation of the species). And Curtis is forced to make a choice between the two. By the way, if people stayed the train, this structure is circle in spite of regime change. In other words, class struggle is meaningless. Let’s see alter ego of director, Namgoong Minsu(Song Kang-ho), designer of security of the train. He was not particularly interested in what passengers of the last car were trying to overthrow the system and they move forward toward the first car. 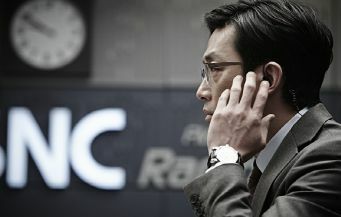 Let’s see alter ego of director, Namgoong Minsu(Song Kang-ho), designer of security of the train. He was not particularly interested in what passengers of the last car were trying to overthrow the system and they move forward toward the first car. He just questioned one thing. If people go outside the train, everybody shall die? Dystopia was terrible because we couldn’t get out of it anyhow. Director asks us. Can’t we walk away from in such a society, man-made system? How about outside the system? The film arouse society system is imperfect because of man-made object. Look closer, you will see ‘Snowpiercer’ is humane and charm despite of some scenes of brutality. If you haven’t, I recommend the movie to you in this summer. 영화를 먼저 관람했던 가족들이 너무 잔인하다고 평하며 상당히 불쾌해했다. 호불호가 극명하게 갈리는 영화라고 알고 있었기에 나는 가족들의 반응을 당연하게 받아들였다. 그래서 영화가 상당히 기괴하고 그로테스크하고 폭력이 난무하리라는 예상 혹은 기대감을 가지고 영화를 보게 되었다. 영화가 끝나고 가족들이 어떤 장면을 잔인하다고 했는지 생각해보았다. 혹한에 벌을 주기 위해서 밖으로 팔을 내미는 장면이었을까? 아니면 피가 난무하는 어두운 터널속의 학살 장면이었을까? 영화가 잔인한 것은 특정장면이 아니라 내용이다. 내 경우, 고립된 열차라는 특수한 상황 때문에 등장인물들의 불가피한 선택 – 식인 – 을 의심했었다. 특히 단백질 블록을 만드는 열차칸은 미장센 때문에 델리카트슨의 사람들을 연상시켰다. 사라진 아이들의 행방이 못내 찜찜했던 나는 윌포드가 스테이크 먹는 장면조차도 의심하며 편안히 영화를 볼 수 없었다. 그러한 상상들이 영화를 끔찍하게 했다. 윌포드가 승객들을 위해 만든 열차는 결국은 승객들을 통제하고 이용하게 된다. 이런 관점에서 본다면, 인간의 편의를 위해서 만든 물질에 의해 인간이 소외되고 지배 받는다는 마르크스의 주장이 영화 밑바탕에 깔려있다. 하지만 감독은 이 해묵은 논쟁에 끼어들지 않는다. 디스토피아를 정말 끔찍하게 만드는 것은 그런 시스템자체를 부정할 수 없다는 사실 때문이다. 지배자도 피지배자도 별다른 대안이 없다. 자원은 한정되어있으며 적절하다고 인정되어지는 수의 사람에게만 혜택이 돌아간다. 그런데도 사람들은 설국열차 밖으로 나갈 수 없다. 세간에는 설국열차가 주제의식이 과잉되었다는 평이 많다. 그런데 영화를 보는 관객마다 생각하는 ‘그’ 주제란 것이 다른 것 같다. 설국열차란 디스토피아는 우리가 실제하고 있는 사회의 축소판이다. 그러나 설국열차에 거론되는 통제된 사회의 절대권력 대한 비판이 조금은 지겹다. 그런 것들은 낡은 화두 –계급투쟁–을 연상시킨다. 영화 후반부에 주인공 커티스 (크리스 에반스)와 기차 설계자인 윌포드와의 대화가 특히 그렇다. 그러나 감독의 관심사는 이 부분이 아닌 것 같다. 어느 한 인터뷰에서 틸다 스윈튼는 이 영화의 주제를 ‘삶과 생존’이라는 단어로 표현했다. 이렇게 주제를 확장시켜본다면 거북한 마음은 줄어든다. 하지만 그렇게 되면 뭔가 놓치는 것이 있는 것 같다. 그럼 감독이 말하고 싶은 것은 무엇일까? 영화 밖의 실제에서는 설국열차가 존재하지 않는다. 현재 상태에서 가정해보는 인류 최악의 시나리오다. 이야기는 만약에 그런 사회가 도래한다면 우리는 인간이기를 포기하지 않고 계속 우리의 삶을 영위해 나갈 수 있을 것인가란 의문에서 시작된다. 보다시피 설국열차 안에서는 ‘인간적이기를 포기하지 않는다’와 ‘인간의 종을 보존시킨다’은 양립될 수 없는 명제가 되고 만다. 지배계층의 윌포드와 의식화된 피지배계층의 길리엄은 생존(종족보존)을 택한다. 주인공 커티스도 둘 중 하나를 선택하기를 강요 받는다. 그런데 사람들이 설국열차 안에 머문다면 체제를 전복시킨다고 해도 이 구조는 순환될 뿐이다. 즉, 열차안에서의 계급투쟁은 무의미하다. 감독의 분신인 열차의 보안설계자인 남궁민수(송강호)를 보자. 그는 꼬리칸 승객들이 기차를 전복시키고 머리칸으로 가는 것에 별 관심이 없다. 그는 기차 밖으로 나가면 정말 모두 얼어죽을까라는 의문을 가진다. 디스토피아는 어떤식으로든 지속되고 그것을 벗어날 수 없기 때문에 끔찍했다. 감독은 우리에게 묻는다. 인간이 만든 이런 사회 시스템에서 우리가 정말로 벗어날 수 없는 것인가? 시스템 밖은 어떤가? 영화는 사회시스템 자체도 인간이 만든 불완전한 것임을 환기시켜준다. 설국열차는 몇몇 잔인한 장면에도 불구하고 자세히 들여다 보면 굉장히 인간적이고 매력적이다. 아직 영화를 보지 못했다면 올 여름 꼭 보기를 추천한다. Han Gong-ju, I didn't do anything wrong. ‘The Terror Live’, the fate of this little movie?